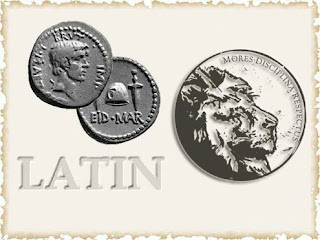 1. an Italic language spoken in ancient Rome, fixed in the 2nd or 1st century b.c., and established as the official language of the Roman Empire. As mentioned in my review of David Sedaris's book of memoirs, Me Talk Pretty One Day, I feel inadequate about being a unilingual person in a bilingual city. My hope was to brush up on my French skills, but I began to realize something - it’s difficult to understand verbs, nouns, pronouns, adjectives, adverbs, prepositions, conjunctions and interjections in another language when, quite frankly, you don’t really have a grasp of what they are all about in your own language. So rather than go back to grade one and start English all over again, I decided I would take a different approach. I figured that since many languages have Latin roots, that maybe if I learned Latin first it would not only help me to understand English better, but any other Latin based language I choose to learn there after, such as French and Spanish. That is the plan anyway. Today was my first day at the local University learning Classical Latin basic grammar and vocabulary skills and I can already tell I am in for a rough ride. Wish me luck – or as the Romans may have said ‘votum mihi fortuna’.